In the February 2013 issue of the Ensign, the section “What We Believe” is about being baptized and receiving the gift of the Holy Ghost. It is on pg. 14-15. The article begins, “We believe we must be baptized and receive the gift of the Holy Ghost (through an ordinance called confirmation) to be saved in the kingdom of heaven. The LDS Church teaches that there are requirements to be saved in the kingdom of heaven. Right here they mention two – the ordinances of baptism and confirmation. However, the Bible teaches that we are saved by grace alone – not by grace plus ordinances. Another way to say that we are saved in the kingdom of heaven is to say that we are justified. Justified means to be made perfectly righteous in the eyes of God. When the LDS leaders teach that you MUST do something (like be baptized) in order to be saved in the kingdom, they are making it a law. The Bible teaches that the law does not save us, but faith in Christ alone saves us. 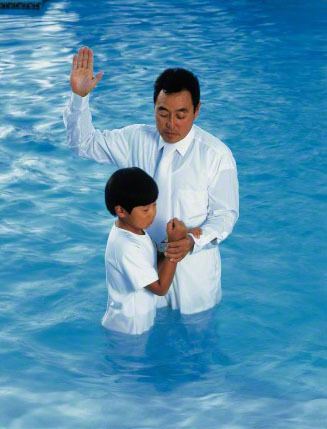 The LDS Church teaches that “born of water” means the ordinance of water baptism, and “born of the Spirit” means the ordinance of confirmation, or receiving the Holy Ghost. However, when we study that verse in context, we find it to mean something different. Here is the text that surrounds the quoted verse– where Nicodemus is confused about how a man can be born a second time. When Jesus explains it to Nicodemus, he says “born of water”. And then he clarifies, “born of flesh.” Therefore, “born of water” means “born of flesh”. In other words, it means when we are born physically into this world. And being “born again” means to be born of the Spirit. Jesus is not talking about baptism. This idea is exclusive to the LDS religion. It’s fine if they believe that ordinances are required for salvation, or that the priesthood was restored, or even believe that it’s somehow possible for any priesthood holder to be “worthy” – HOWEVER, the LDS Church claims to be Christian, and claims that they believe in the Bible. Therefore, this is a contradiction in their claims. First of all, the Bible teaches that no one is “worthy”. Second, the priesthood of the Bible (the one that the LDS Church claims to have been restored only to them) was given to the descendants of Aaron. It was the lineage that was required – not righteousness or worthiness. Also, the priesthood of the Bible has nothing to do with baptism. The purpose of the Biblical priesthood was for a high priest to make animal sacrifices to cover the sins of the people. The priests and high priests had ceremonial washings in order to prepare for these sacrifices, but they had nothing to do with baptism, or confirmation. I’m thrilled to point out that this next sentence in the article is Biblically accurate! Baptism is just that – a symbol. It’s an outward symbol of what has happened on the inside – that we have died in our old self, and become united with Christ to become a new creature. (2 Cor. 5:17) It is not, however a requirement for salvation. It is something new believers do to obey and be identified with Jesus. It’s just a symbol. But then the LDS Church adds some kind of “covenant” that is not found anywhere in the Bible. What this means is that once you are baptized, if you break any of the commandments, God is no longer under a covenant to forgive you, give you the Holy Spirit, or offer you eternal life. What a heavy, crushing burden to bear! The only way around this is to delude yourself into thinking that you can actually keep all the commandments all the time. I’m sure there are many people who are comfortable with living in that delusion for now. But the eternal consequence of that choice is NOT heaven. The Church does offer a process of repentance – but that is a topic that needs its own article because it, also, a burden on the people, lengthy to describe, and impossible to really do. If we read this verse in context, it actually disproves that baptism and confirmation are what bring us into the household of God. “Therefore remember that formerly you, the Gentiles in the flesh… that you were at that time separate from Christ… But now in Christ Jesus you who formerly were far off have been brought near by the blood of Christ. What was the enmity? The Law of commandments. What was the Law of commandments contained in? Ordinances! The leadership of the LDS Church has continued to teach that the ordinances of baptism and confirmation are required for entrance into the kingdom of heaven. The Bible teaches that they are not. Being united with Jesus Christ is the entrance. In the February 2013 issue of the Ensign, the LDS religion FAILS this test.